In the early summer of 2000 – a dream became reality. 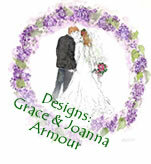 Grace Armour, together with Joanna Armour and Jeannie West – put their talents together and created “Great Turtle Creations of Mackinac Island.” The products were designed for brides who were choosing Mackinac Island for their weddings. After also seeing the demand for note cards relating to Mackinac Island, a note card sidelines was established with Jeannie West as the exclusive artist for this enterprise. Since every year we receive many wonderful comments, we want to share some with you. - Thank you for all the samples you sent – so hard to choose. Will be placing an order very soon. - The announcements were perfect. Thank you. - Loved the baby shower invitations – they made a BIG hit. - Thank you for your suggestions – we can tell you know Mackinac Island. Thank you so much. - Thank you for the announcements, everyone loves them. - Thank you everyone. They are beautiful. - Thank you. It is Perfect! For all your extra effort, go get a coffee on me. - Just wanted to let you know that I loved the invitations! The packaging was lovely as well. Thanks so much! - I received the thank you notes, sealing stamps, place cards, and programs in the mail today. Everything looks wonderful - I couldn't be more pleased! - We received the samples. We love them. We plan to work with you. - I just discovered your website and loved your invitations. We are having a small wedding on the island at the Grand Hotel and the invitations seemed to be such a perfect fit. - Thank you so much for all of your work on our daughter's invitations, thank you cards, programs, remember the date, etc. They were beautiful. - Thank you for the beautiful samples. How wonderful they turned out and it is exciting for me to see them in print! We will be ordering programs with inside as soon as the ceremony details are ironed out. - Received your wedding samples yesterday. They are adorable! – We will definitely order invitations and place cards . . . we will get our order together and contact you. We would love to serve you. Please contact us at: creations@greatturtle.com or cell 517-242-2942.
to all pictures presented by Jeannie West.